Missing teeth not only impacts your smile, but they also affect your ability to eat and speak. Dr. Rupporn Priyawat and Dr. Maria Kim at Omnia Dental Care in Chino Hills, California, offer a number of options to restore your teeth, such as dentures. To learn more about your replacement options for missing teeth, call Omnia Dental Care today. Dentures replace teeth that have been lost to decay or injury. You can easily take dentures in and out of your mouth to clean them. Omnia Dental Care customizes your dentures so that they fit your mouth perfectly. The type of denture you need depends on the degree of tooth loss and the health of your mouth and remaining teeth. The team at Omnia Dental Care works with you to decide the best type of dentures for you. After you’ve had all of your teeth removed, Omnia Dental Care creates conventional dentures, which are a full set of removable teeth. While you are waiting for your conventional dentures, they provide an immediate denture, which is a set of temporary dentures you wear until your gums are fully healed and able to hold your more permanent set. For optimal jaw bone health, it’s best to retain some of your natural teeth. If you don’t need to have all your teeth removed, you may be a candidate for partial dentures. They attach to your natural teeth or a crown and replaces only the missing teeth. Dentures can improve eating and speaking, but it may take some time for you to get used to wearing them as your mouth muscles and tongue learn how to keep them in place. You should care for your dentures as you would with your natural teeth. Brush them at least twice every day to remove food and prevent staining. It’s also important to keep your dentures from drying out by soaking them in water or a special denture cleaning solution when they’re not in your mouth. In addition to brushing your dentures, you also need to continue to take good care of your mouth and brush your gums and tongue to keep your breath fresh and the bacteria counts down. Lastly, come in for regular checkups to check the fit of your dentures. Your mouth changes over time, which may cause your dentures to feel loose. 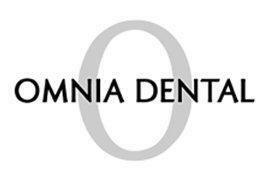 Omnia Dental Care can adjust them for a better fit. To learn more about dentures, call Omnia Dental Care to book an appointment today.